Jan. 8, 2018 — Continuing our federal race outlook to set the political stage in this first week of the actual midterm election year, we now turn to the House races. Republicans have a 24-seat margin (counting their three vacant seats that will go to special election in the early part of this year: PA-18, AZ-8, and OH-12), and though Democrats and most in the media claim that a new majority is just around the corner, a race-by-race House analysis shows that the road to converting the majority remains difficult to attain. This is so for several key reasons, not the least of which is the typical House incumbent retention factor. In 2016 the rate hit 97 percent (377 victories for the 389 House members who ran for re-election). Additionally, even though President Trump’s job approval rating is historically low, we must remember that he won the 2016 national election with a personal approval index no higher than his present positive to negative ratios. And, even though congressional approval was well below 20 percent for the entire 2016 election year, Republicans lost only six House seats from their previous modern era record majority of 247 that was attained in the 2014 election. 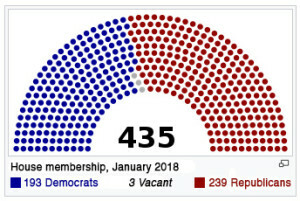 When we have seen major seat changes occur in past elections, the winning party has done well in converting open seats. For the fourth election cycle in a row, the 2018 House cycle features an above average quantity of incumbent-less US House campaigns – the current number is 45, counting the two latest announced retirees, Reps. Bill Shuster (R-PA) and Gregg Harper (R-MS). With Democrats having to protect 15 open seats, they look to convert as many of their opponents’ open 30 as possible. Unfortunately for them, only two seats appear ripe, one in Florida and the other in New Jersey, while 23 look to be either safely or likely Republican. The open seat category outlook could change if late judicial redistricting decisions drastically alter the political maps in Pennsylvania, Wisconsin, and/or Texas where Republicans are defending a total of eight open seats in the three states. Another five GOP-held districts lean R, and it is within this group where Democrats are virtually forced to run the table just to position themselves for a legitimate shot at converting the majority. Beginning regionally in New England and the tri-state area of New York, Pennsylvania, and New Jersey, the Democrats would have to gain a net minimum of six seats to meet their power-shift quota. Though several targets appear in Upstate New York and maybe as many as four in the Garden State, defeating multi-term incumbents who have won in good Republican years and bad remains a formidable task. The party’s road becomes much smoother, however, if the Pennsylvania state Supreme Court rules in favor of the Democrats’ lawsuit that claims the current district boundaries are a political gerrymander. If the lines are re-drawn, the party could do better than netting six seats from the northeast region. If not, such a number will be difficult to attain even in a so-called “wave” election year. Assuming the six-seat conversion in the northeast, the Democrats must then gain two seats in Florida, and one each in Virginia, Texas, Kansas, Nebraska, Iowa, Minnesota, Colorado, New Mexico, Arizona, and Washington, and then take five of seven targeted districts in California. And, on top of all this, they must protect five of their own vulnerable seats in Nevada, Minnesota, and New Hampshire, meaning their real number to attaining the barest of majorities from the most hotly contested campaigns is actually 29 … and, that assumes they re-elect all of their own incumbents who are seeking re-election. Furthermore, and most importantly, we must remember that the Dems must achieve ALL of the aforementioned quota goals, and if so, their reward is a mere one-seat majority. Though there are clear signs that the impending election year could be a strong one for Democrats, changing majority status remains a very tall task.